Initially I was noticing that my CW power levels on my transverters was spot on but when I switched over to SSB that my power was really low. Don suggested that I should test K2 on 40m (forget the complexity of the tranverters for a minute to baseline the system.) After I did that I noticed on 40m my LSB signal was about -3dB compared to my CW signal. I then send a note to Elecraft reflector to get some feedback. Geoff GM4ESD made the suggestion to run the same test at 28mhz (IF freq for the transverters) and see if I had similar (linear) results. I liked Geoff's suggestion so much that I decided to test all of the major bands and then graph it out. I ran the test twice. I used my Ubuntu laptop to generate an audio signal at a fixed frequency to help improve the reproducibility of the test. Test 2: I played the audio (very loud) over the speakers and placed an Icom HM-36 microphone near the amplified speaker at a fixed distance. Both tests produced similar results. 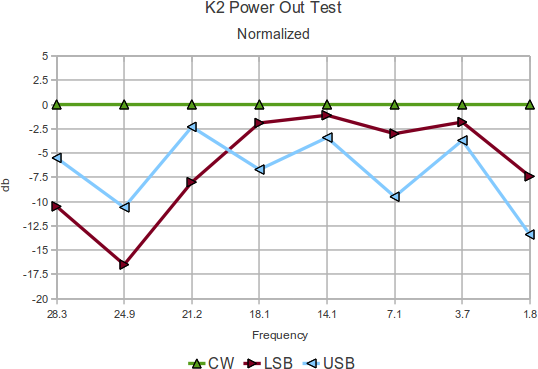 I then normalized the results with the CW level being referenced to zero and built the graph above. Initially I was thinking that maybe I had an issue with the microphone bias but I think that I have disproved that by using the audio out of the computer. --Still looking for answers.